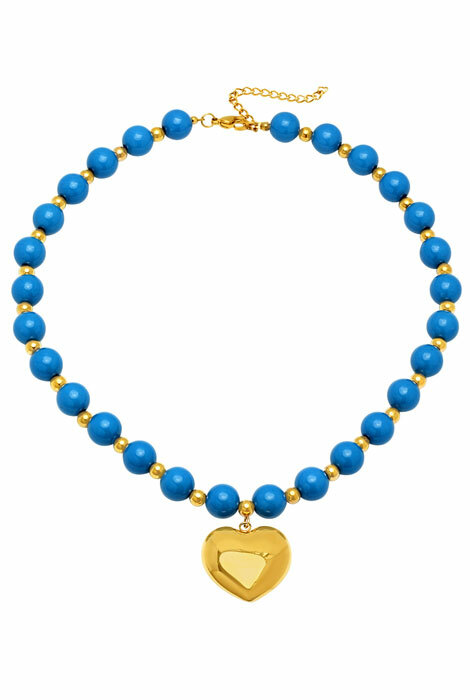 Add this blue beaded necklace with heart pendant with it's bold heart charm to complete any outfit. 28 beads are separated by small gold tone beads for a touch of elegance. Made with stainless steel, a quality choice in jewelry design because of its beautifully polished finish, durability, and resistance to rust, oxidation and discoloration, even in humidity. Pendant necklace measures 17" long which includes a 2" extender. 1" wide heart charm. Lobster clasp. Polish metal jewelry with a soft, dry cloth. Allow 2–3 weeks for delivery.